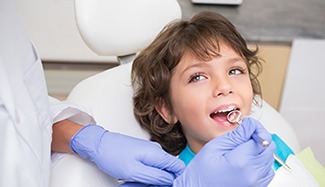 Children’s dentistry focuses on the early development of your child’s teeth. Treatment procedures include a long-term perspective on the physical growth and development of your child’s body and their teeth. Tooth development issues occur as your child ages. Your children’s dentist recommends that you begin good dental health habits early and based on age appropriateness according to their development. Your child’s teeth and gums can benefit from positive oral health habits before their first tooth appears. Preventive dentistry is effective even for infants. Ask your children’s dentist in Palm Beach Gardens about simple tips to help assure the proper development of your child’s teeth and gums. Schedule your child’s first dental visit before they develop their first tooth. This helps create good dental health habits and eliminate fear. Dental sealants are excellent protection for your child’s teeth. The treatment helps prevent the risk of tooth decay. Orthodontic dentistry treats any tooth alignment issues that occur during your child’s development. Ask your children’s dentist about orthodontic treatment options. Contact your Palm Beach Gardens children’s dentist, Dr. Alvarez, and ask about age appropriate dental care for your child. Dr Fernando Alvarez has two children of his own so he knows what is needed to make your child’s visit to the dentist a happy occasion.